This entry was posted in Digital Marketing and tagged digital marketing on May 18, 2015 by admin. A new mobile app called Shuffle has launched a simple utility that lets you create additional, disposable phone numbers you can use to call or text as well as receive voicemail through, right from your iPhone. The app is a competitor to longtime favorite Burner, which has, for some time, offered similar functionality. But Shuffle takes things a step further, by also allowing you to create email aliases that forward mail to your main inbox. It’s not unusual for people today to only have one phone: a mobile phone that often functions as their work, home phone and mobile number. But sharing that personal phone number with everyone ranging from work colleagues to some random guy looking to buy the sofa you’re selling on Craigslist doesn’t always make sense. That’s where apps like Burner have historically been able to help. Instead of posting your private cell number to the web, or sharing it with others you’ve only just met, for example, Burner lets you set up virtual phone numbers that work with your mobile device so you can still call and text without giving up your privacy. With Shuffle, however, founder Craig Collett wanted to introduce a tool to further protect users’ privacy by adding in support for email. “Individuals have the need to protect their personal privacy and keep different business and social aspects of their life separated,” he explains. For example, a user could set up different “shuffle” numbers and emails for their personal and social connections, work colleagues, other secondary businesses, dating services, classified ad postings, job searches, social networking sites, short-term projects, and more. If a phone number became compromised by spammers or telemarketers, you can just delete it and no one can reach you on that number again. In addition to protecting your privacy, services like this also make sense for travelers who want to be able to establish a local phone number when they’re visiting family, friends or others out-of-state. The app itself is easy enough to use, though it does feel a little rougher around the edges than competitor Burner in terms of its sign-up flow and overall design aesthetic. However, the user interface is in other ways an improvement, as it allows you to color-code your disposable numbers which can help you quickly find them in a longer list with just a glance. The app also introduces a different pricing model that’s a bit more transparent. In Burner, you buy extra phone numbers using credits, which you have to purchase in packs of three and up. Not everyone likes this model because you’re often stuck with leftover credits. Shuffle instead charges fixed fees. A single number is $1.99 per month and you can configure it to auto-renew. It then charges per transactions: calls in from regular numbers are 1.5 cents per minute; calls out are 5 cents per minute; texts are 1.5 cents; shuffle-to-shuffle calls are 1 cent per minute; and shuffle-to-shuffle texts are free. Each email alias also charges .75 cents per forwarded message. (Picture messaging is coming in a future update, pricing TBD). Assuming you use Shuffle heavily, these small fees could add up over time into several extra dollars, but if you’re only planning to use it for temporary things like an online ad, it wouldn’t break the bank. Like others in this same space, Shuffle is also built on top of cloud communications providerTwilio’s platform. Collett, previously a business analyst in Alberta, first began building Shuffle (then called Privici) back in 2013 in his free time. But as of December, he quit his job to work on bootstrapped Shuffle full-time. The app itself is now a free download on iTunes. An Android version is in the works. This entry was posted in Digital Marketing and tagged digital marketing on May 17, 2015 by admin. Self-driving cars may have a long road ahead before winning over mainstream American consumers. According to a Harris Poll survey, charted for us by BI Intelligence, 33% of all US adults indicated they will never consider buying or leasing a self-driving vehicle. The distaste for self-driving cars was even higher among older groups, with 36% of both Generation X (ages 38-49) and Baby Boomers (ages 50-68), and 50% of Matures (69+) indicating they would never buy/lease a self-driving vehicle. We’re still years away from a time when self-driving cars are available to the general public. The fact that two-thirds of Americans are not completely averse to the technology is promising. Still, there are clearly concerns about the safety and reliability of self-driving vehicles — 22% of respondents said they would consider buying a self-driving car when the “bugs” have been worked out. 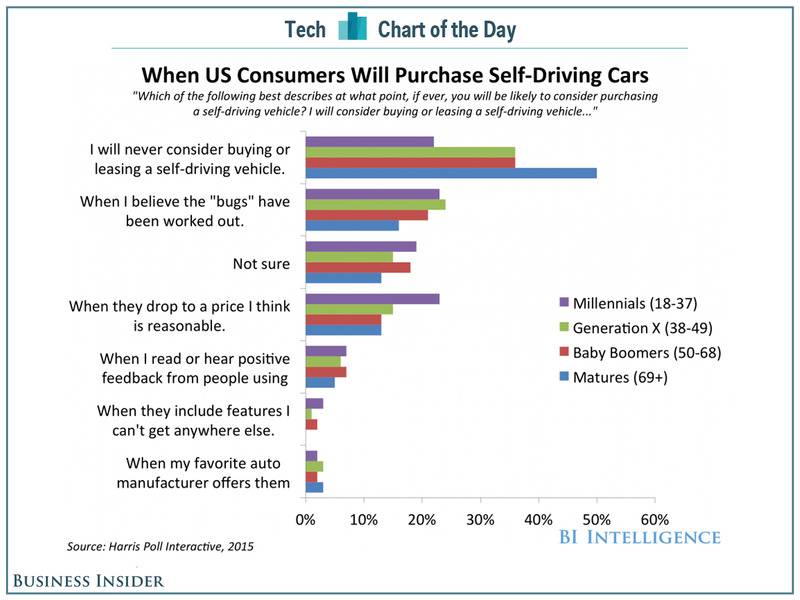 All age groups except the Millennials cited concerns about technical bugs as the main reason for not buying a self-driving car. Google will have to allay those concerns if it wants its autonomous cars to catch on with the public. On Monday, Chris Urmson, the director of Google’s self-driving car program, announced that the company’s prototype vehicles have been involved in only 11 minor accidents, with no injuries, during 1.7 million miles of driving. “And not once was the self-driving car the cause of the accident,” Urmson noted, though he did not provide any details about the accidents. This entry was posted in Digital Marketing and tagged digital marketing on May 11, 2015 by admin. This entry was posted in Digital Marketing and tagged digital marketing on May 10, 2015 by admin. This entry was posted in Digital Marketing and tagged digital marketing on May 9, 2015 by admin.